Blog Challenge - How have I changed in the last two years? I've decided to participate in a blog challenge this month, just for fun and to get myself back in the writing groove. Since school's been out and I've cut back on dance, I've really been enjoying reconnecting with myself - time to create again, time to relax and sit in the sun. I won't quite dance completely but for fall I will cut back, opting out of the performance classes and dropping in where my schedule allows. Maybe a bit of a break will be good for me. Besides I'm still figuring out my muscle pain and trying to heal that dang heel spur pain. (1) in the past two years I've changed a lot in my dance. I've been to several workshops, I've tried different teachers and I've done several performances. Although I still get the backstage and preparatory jitters, I have since realize that nothing bad will happen if I do make a mistake. For my last big performance in June, I worked very hard on learning the pieces, I took two days off work to sew my costumes and I had a meltdown backstage that only my instructor could bring me back from. But on stage I think I did pretty well. However, to date, I have yet to see a photo or a video and that's very frustrating to me. In fact this past year*, I had promised myself I'd work harder than I ever had and I would take all the workshops that I could. I even applied for - and won - a dance scholarship. Unfortunately at all the performances I did this year, I somehow managed to be completely in the wrong spot for the photographers. I was cut out of one whole video and two far from the lens in another and still waiting for the June videos. Photos were pretty much the same, due to space constrictions and the fact that I'm a nice gal, I took to the back row a couple of times - unfortunately that meant I wasn't visible for photos. Since no family or friends (non-dance friends) were at my performances, I have no real feedback on how I did. And that's a deal breaker for me. It was a real lunchbox let down. And it's changed my approach for this upcoming year. (2) As with most people, I've evolved with my crafts - I look back to things I've put up in my shop over the past couple of years and I wonder about my thought process. I hope that I'm making much nicer items and better choices for the products now. (3)With age, I've mellowed. Or I'm trying to mellow. See my previous posts on 'occupational burnout'. I'm trying to relax and not let work stress me out so much. I do like my work, but my employer doesn't have the best way of dealing with people and some customers are absolutely hellish - but the bottom line - I like my work. 3 day dance retreat in the next town over. Upon careful reflection, I decided I had two choices - either I change my job, or I change my thinking. And since changing my job wasn't an option, I had to change my thoughts. One day a book of continuing education courses from the local university came in the mail. I decided that the courses would either help make me more marketable for a job change (if/when necessary) and/or the subject matter would help me deal with my current work situation. In case you're wondering - I am an employee of a large corporation but I work from home. I don't have any local co-workers and my manager is in Toronto. If I was in an office environment, I'm sure I'd be able to sit down with my manager or the HR department and work out a mutual solution to help me. And yes, I could phone the HR department, but without them knowing my position or even knowing me personally I'm concerned that the results may not have a positive outcome for me. The first course that was available was a Human Resources course about the HR department being an effective business partner within the organization. It opened my eyes as to what the HR department does and I learned a lot about how a strategic partnership was possible. Unfortunately the next couple of courses were sold out, so I tried a Business Management course on Leadership skills - also extremely enlightening and informative. The next one was Conflict Resolution and the third one was Business Management and Adminstrative Skills (finding and keeping employees) . Not only did these courses open my eyes and provide new and valuable information, I also learned that some of my struggles were not unique to me (okay I technically already new that, but now I could hear from others about how they handled the same issues) and most importantly, I was able to meet and 'network' with others in my local community. The courses have currently stopped for the summer, but I have already received the new fall schedule and I'm looking very forward to the upcoming classes - in both Business Management and Human Resources. The best news - my employee refunds my tuition upon successful completion (one of the few perks still available). Just like so many other bloggers, you take a break thinking it will just be short while and suddenly you're out of the habit and weeks turn to months and then you wonder if you should continue writing at all. Yes, it's now the beginning of July and I last posted at the end of February. I really didn't think it was that long. (it's often that way, isn't it?) I thought about my blog often. I had ideas I wanted to write about but then would put aside for later, and life came and went and time passed as it always does. I also ponder the point of writing blogs nowadays. First there are so many blogs and so much to read, how do people have the time to get to it all? Over time, I optimistically signed up for all sorts of different newsletters to be emailed to me and then just let them pile up in my inbox until I have a thousand messages. I fell away from reading other's blogs because I was addicted to Facebook and spent all my time scrolling through the content there. So much to read, so many videos to watch. And like so many others, I spent too much time watching and reading about other people's lives that I neglected my own. The largest struggle this past spring was my job. Oh yes, I have long struggled with my job and I'm sure I've written about it many times before. I love the work but struggle to understand those I work with and there are some accounts/customers that are truly very difficult to deal with on a daily basis. But with the current job market and the high cost of living even just outside of the Vancouver area, I am hesitant to make the change elsewhere. I struggle with the possibility that I could be more fulfilled elsewhere - or not. I could be paid more - or not. I could be valued and rewarded more - or not. I very conscious that the grass isn't greener and one often ends up only exchanging one issue for another. I'm faced with the "devil you know" mentality. And then this past spring I reached what I'm very certain was 'occupational burnout'. No, I didn't seek medical help - do you really think a GP doctor is going to address that. Besides, they would probably either prescribe an anti-depressant or sign paperwork for a stress leave. Neither of which I wanted to do. If you're still here, I think I'll break this into a couple of posts. I know when I see a really long article or post, I tend to skip it to read it later... and then I often don't. So I'm going to say more another day. And if no one is reading, then this may just be a good online journal for me. I'm ecstatic that is was purchased. A lady bought it as a gift to her niece. But it was a lovely one-of-a-kind piece (even though I used a pattern, it was still very unique) that I really liked. It just means I will have to make myself another one, doesn't it? Too bad I couldn't capture it as well in the photo, but it was pretty cool the way these trees were steaming in today's sunlight. And, yes, I know many of you are under snow or currently in the middle of a blizzard, so it must be an even odder sight to see. Well that's Vancouver for ya - we live in a rain forest - sure looks like it doesn't it? 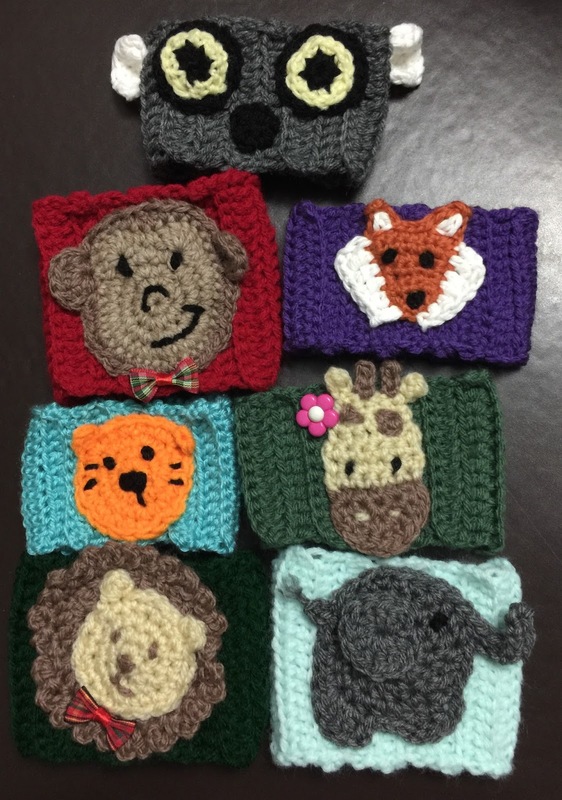 This weekend I was busy crocheting 7 cup cozies to help out a friend. She's a volunteer at the Greater Vancouver Zoo and had made a stack of cozies to be sold to raise money for animal care. Except, she came to work the other day to found out several of the ones she made had been stolen. The giraffee, elephant and monkey come from Repeat Crafter Me's Animal Alphabet. The fox, I can't remember where I found the pattern and I made up the tiger and the lion by copying a photo on pintrest. The lemur was completely made up by me. I sure hope they don't get stolen again. Check out this link to a fabulous knitting production calculator- Project Calculator. Great suggestions isn't it?